If you've ever tried budgeting for the long run only to find that your best-laid plans always seem to get ruined by short-term emergencies, then you're not alone. Unexpected things pop up that can surprise even the most dedicated budgeters. Many times, we thwart our noblest intentions to save money by allowing "spending leaks" to dampen our finances. I found out the hard way recently how a spending leak – a literal one – cost my family hundreds of dollars in 2010. It all started with a leaky tub faucet in the hallway bathroom. As it turns out, after my teenage daughter, my 11-year old son or my five-year-old daughter would take their showers or baths, one of them would invariably not turn the spigot completely off. And even when they did, little beads of water continued to drip – 24 hours a day. After several months of high water bills – between $125 and $150 a month – my husband, Earl, told everyone to be more careful about water use around the house. He also went ahead and fixed that leaky tub. I can't tell you if the kids are truly being more conscientious about conserving water. But I do know that our December 2010 water bill dropped back to more normal levels, around $35 monthly, saving us about $100 a month. And the utility bills have consistently been lower since then, too. So think about your own life: Are there areas where you're spending money and literally washing cash down the drain? If so, it's time to plug your own leaks. For instance, that car of yours that keeps giving you headaches? Instead of throwing good money after bad with local mechanics or getting by with a little elbow grease and know-how from your cousin who's handy with a wrench, maybe it's time to head to the dealer to get the problem fixed properly, once and for all. If you spend the money now getting something done right, you won't get a nasty surprise with that ailing car a month or two from now, which can blow your budget. Remember when you were a kid and you got money for your birthday, a holiday or some special occasion? If you got to spend that money as you pleased, chances are, that was a real treat. But you might also remember a bit of sadness, once you realized the money was all gone. If this sounds vaguely familiar, what you experienced was actually preparing you for the real world: None of us has an infinite amount of cash, so we've got to use what we have wisely. Doing it this way, you budget ahead of time how much cash you can spend on each of these areas during the month. Then you put that amount of money into an envelope. The key is: Once the money in the envelope is gone, it's gone. You can't go dipping into other envelopes, nor should you over-extend yourself by using credit cards just because you want to continue spending. 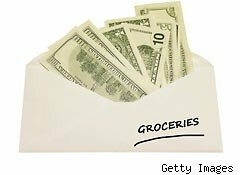 One benefit of the envelope system is that it serves as a constant reminder that money does eventually run own if it's not saved, just as it did when you were a kid. If you do yourself a favor and set up an envelope for "savings" – and treat that envelope as if you were paying for any other expense – I can promise you, you'll reap the rewards of paying yourself first. And not only will your present-day bills get paid, but you'll gradually start building your savings for the future, too.